Blanca in Modesto, CA asked a very interesting question: Is there a way to perform a mail merge with email? In other words, Blanca was asking if it was possible for her to customize an email so that each person in her distribution list received the email customized to a level as highly personalized as she wanted? The answer, as is usually the case—it seems almost impossible to find a business problem that the Microsoft Office Suite can’t handle, even if it involves advanced techniques such as VBA—is YES. Prepare your email message in a blank/new Word document, either leaving spaces or temporary placeholders (recommended; e.g. “FIRSTNAME”) for the fields that will change for each recipient. Select Recipients, using the same method you would if you were doing a regular mail merge. 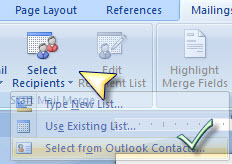 Instead of selecting a table, query, or excel spreadsheet as the source, however, you connect directly to your Outlook Contacts. 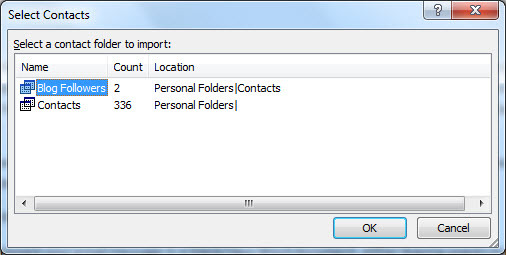 Because you will likely want to send to only a subset of your contact list, I recommend you set up a new folder for the contacts to whom you want to send the personalized message. You can either move or copy them from the default or main list. Once you’ve connected to the source contact list, you’ll be given the opportunity to view and, if desired, change the information and details for any of the contacts. The next step is to enter the personalized or custom fields. This is why you do mail merge in the first place, right? This is also why I recommended putting placeholders in every location where you want to add personalization. First Name (e.g. “Dear John”) and bonus amount (e.g. “Your bonus is $2,000) are two examples. You can preview the impact of any added merge fields by selecting the “Preview Results” Option. 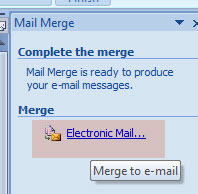 Once you are satisfied that the contact list is correct, you can proceed with the merge. 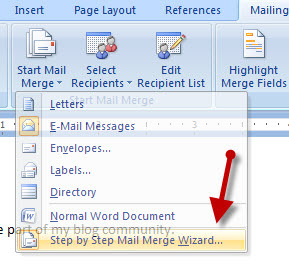 The easiest way to do this is by using the “Step By Step Mail Merge Wizard”. Completing steps 1 through 5 above should put you at the final step of the process. If not, you can simply skip the early steps, making sure along the way that the actions you took in steps 1 through 5 above have taken effect. The only thing left to do is complete the merge by clicking on the “Electronic Mail” link.